Amol R. Madane has completed Doctorate of Philosophy (Ph.D.) in area of Video Security under the guidance of Dr. uttam D. Kolekar. He had completed his post-graduation in engineering from Sardar Patel College of Engineering (SPCE), Andheri (W), Mumbai in 2007 and bachelor of engineering from B. N. College of Engineering from Pusad, Dist- Yavatmal. 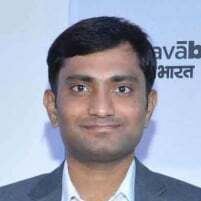 Currently, he is working with Tata Consultancy Services Ltd. as Technical Architect. His corporate experience is 10+ years. He had worked into various roles such as researcher, principal evangelist, trainer, developer etc. He has published technical book on “Design and Performance Evaluation of Image Encoders in View of 4G Applications” by Lulu book publishers, Raleigh, NC 27607, United States. He Published 6 research papers in international journals, 11 in international conferences, and 14 in national conferences in area of Digital Signal Processing, Video Processing, Image Processing, ADAS. He is professional member of IEEE, IETE, IEI, ISTD, CSI, ISTE, ACM.